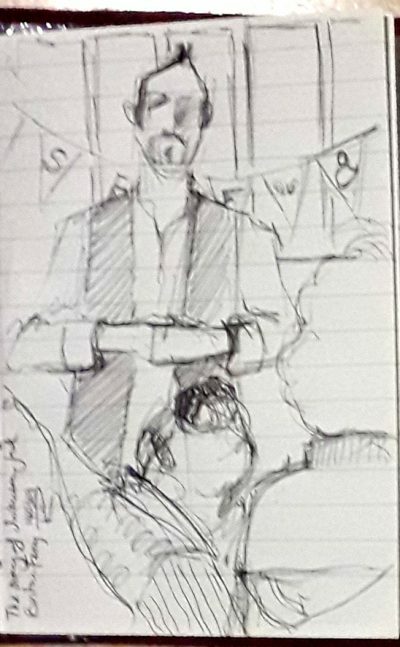 Here’s a quick sketch I did at an event the other night, a talk on women’s political action across Europe, one of the International Women’s Day events. I spent a lovely hour or so painting bunting at an event organised by Women4Resources, a small organisation working with women and girls in partnership between Wales and Africa to promote education. Today was about promoting wellbeing and I loved just chilling out with women of all ages, chatting and doing some painting for fun, instead of for work. It took the pressure off. I based my little bit of bunting on the Welsh word “menywod” which means women. I got quite psychedelic. There’s some confusion about the origin of the word “bunting”, with some sources citing it as French, others as Scottish. When I was little I thought it was a verb and wondered how you might ‘bunt’. Apparently it is something to do with American baseball. Husb and I went to a lovely evening at GS Artists (formerly Galerie Simpson) on Swansea’s High Street yesterday. In an evening celebrating Saint David’s Day (the patron saint of Wales) the talented Tomos Sparnon introduced the first of a series of Welsh Conversationals, Welsh Language events at the gallery focusing on ‘Mynegiant’ (Expression) in Welsh art. It was bi-lingual in an easy and lighthearted way, with a slide show of work that illustrated the list of Welsh words. He covered artists Gwen John, Peter Prendegast, Seren Morgan Jones, Ogwyn Davies, Tim Davies and his own, rather lovely, work. Of course, I had a scribble. And made notes, And learned some new Welsh words. And there was some lovely home-made leek quiche made by the effervescent Jane Simpson. Here’s a drawing I did a while back, en plein air, walking on the Brecon Beacons in winter with a sketchbook of black paper and a stick of white soft oil pastel. It was a very misty day, the fog hung heavily over the landscape and washed out the colour from the surroundings. I go to lots of talks at galleries and museums and it’s a good opportunity to have a bit of a scribble, but it usually means drawing backs of heads. That’s okay though because any practice is good. And if there’s a cluster of people, there’s a chance to get to grips with a bit of proportion and perspective as well.